OK, so there may not be a lot of actual research going on in this post, but we at Corona have a wide variety of interests and sometimes like to show those off too! One such interest is that I have been shooting professional fireworks shows for over 20 years. I got my start in helping out my dad back when I was in high school (and when the regulations for the minimum age for helping on a show were more…loosely enforced). Since then, it’s been a summer hobby of mine for years. Though everyone knows what fireworks are like when they explode, I have found over the years that very few people have any idea what it takes to put on a good show! Even for a relatively small show (I was in charge of the show in Lafayette, Colorado for 5 years), it takes a crew of at least 5-6 people an entire day to get ready for the big event. Here’s a quick overview of the steps involved! Place and secure the mortars. 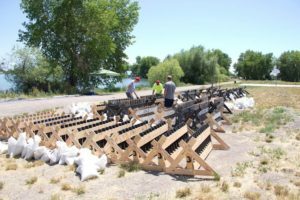 Nearly all aerial fireworks are shot out of mortars (tubes), so the first step is to distribute large racks of mortars and secure them using braces, sand bags, or even burying them. Professional fireworks are really powerful, and failing to properly secure the mortars to ensure safe operation can lead to disastrous results. Distribute and load the fireworks. This is possibly the easiest part of the process to understand, but it is also one of the most dangerous steps. Crew members distribute the shells according to the plan and carefully drop them into their assigned mortar. While every precaution is taken to ensure that devices are safe during this process, it’s not unheard of for a shell to ignite while being dropped into a mortar, so it’s important to keep body parts away from the top of a mortar! Wire everything up. 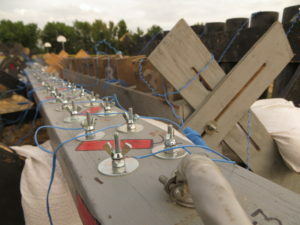 Though it is possible to ignite a professional firework device by hand, a vast majority of shows are set off electronically. That doesn’t necessarily mean computerized, but it means that an electric match is inserted into the fuse of the firework so that it can be lit from a safe distance. (If you’ve ever fired off a model rocket, it’s the same concept.) Once the e-matches are inserted, each is wired to a “rail” with a designated ID number so that we can set off that shell exactly when we want to. Connect the firing board and test everything out. I often describe the function of a firing board as being like a big kids’ version of the game of Operation. There is a stylus with a metal tip and a wire coming off of it, and when you touch the stylus to a terminal, it completes the circuit, igniting the e-match and sending the shell airborne. Before we do that, however, we always test everything out to make sure that our wiring is in good shape to shoot the show. If everything goes well, everything will be loaded, wired, and tested with plenty of time to spare (since weather or other issues sometimes cause delays). Most of the time, though, there is time to sit, relax, and enjoy a nice, summer evening. Shoot the show! This part is just as fun for the crew as it is for the audience. All of our hard work in the hot sun pays off for 20-30 minutes as we get to satisfy our inner pyromaniacs and blow up a ton of stuff in a short time! It’s always a blast (pun intended). Clean it up and go home! You’d be surprised at how much work goes into cleaning up after a fireworks show. Not only do we have to haul all of the equipment back into a truck that same night, we also have to safely inspect the shoot site to ensure that no fireworks are left in mortars and that there aren’t any “dud” shells that came down in the area. It’s not the most glamorous part of the show and usually takes at least 2-3 hours, so the crew usually doesn’t leave until well after midnight. Fireworks shows are a lot of fun for both the audience and the crew, but it is definitely a ton of work that requires a special type of worker to enjoy. (Spoiler alert: fireworks crews aren’t paid like kings.) I hope that this inside look will help you to appreciate all of the work that went into making your 4th of July holiday memorable! Previous PostCorona presents on marijuana research at upcoming conferenceNext PostWelcome, Molly and Sandra!